Luann de Lesseps is taking to her Bravo Blog to dish on last week's episode of The Real Housewives of New York City. 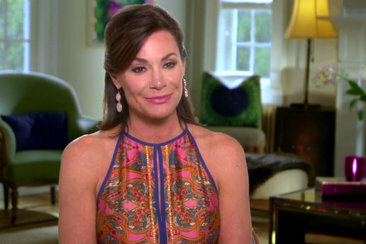 Luann de Lesseps reflects on her Palm Beach drunken arrest. "You really know who your true friends are when you are going through a rough time. The girls reached out to me after my arrest in various ways, from texts to phone calls, and I appreciated everything they did to make me feel better. Even now, I grapple with understanding exactly what happened. As Bethenny said, “Nothing good happens after midnight.” Amen. My plan was to spend a couple of nights with a girlfriend, then head up to Jupiter to spend Christmas with my brother’s family before heading to South America for a friend’s wedding. Palm Beach is a small town, and I found myself going to all the same places I went to with Tom. I was arrested at the same hotel where I had a brunch that concluded our wedding weekend. Although I knew before I left NYC that I hadn’t processed my emotions about my divorce, I didn’t seek professional help. Instead, I was self-medicating to kill the pain…never a good idea! I hit a wall in Palm Beach, and the impact of my actions made me realize that I had better deal with my issues before I hurt someone or myself. One of the best decisions I made in my life was to attend Futures in Tequesta, Florida. I felt like I reconnected with my soul there, and I did a lot of healing. My mother, my family, and my friends have been incredibly positive, and I feel like I don’t have to go through this alone. I know it’s weird to say this, but I’m incredibly thankful for what happened, because it made me come to a full stop so that I could take care of myself, which I was not doing. Also, I’m truly sorry for what happened during my arrest, and I want everyone to know that I have a tremendous amount of respect for the Palm Beach police department and for all first responders. On a much lighter note, according to Sonja, raw bars are the new vegan! Love her, and I love you all too. Until next week, let your friends know how much you care in the good times and the not-so-good times."